Direct Energy is excited to offer you room by room packing tips to ensure a smooth moving experience. Pick a room and our guide will show you ways to make packing as simple as possible. For a printable version of our Packing Tips Room By Room click here. 1. Pack books of the same size flat or the spine touching the bottom of the box. Avoid using large boxes that will be too heavy for you to lift. Be careful not to over-pack your books in cardboard boxes as they can easily cause the box to break. 2. You can also use a travel suitcase or clear plastic boxes for packing your books. 3. When packing electronics, keep a pack of colored stickers to mark the port and cable, so you know exactly how everything is hooked back up. Take photos of the electronics settings to help you remember how to reassemble it later and to provide proof of its condition before the move. 4. Important documents like contracts, insurance information, school, and medical records may be placed in large manila envelope or in a plastic box to keep with you. 5. Your toolbox should be the last thing you pack and the first thing you unpack! 6. Brooms, mops and garden tools should be bundled together securely with strong plastic cord. Use old towels or linens to wrap and tape any sharp-edged tools. 7. Before moving the grill, dispose any charcoal. 8. Clean furniture and dismantle it as much as possible. Place chair padding in a separate box or clear garbage bags. Donate what you can. If you have to move packaged food, be sure to pack boxed or canned goods in small boxes. Dispose any open packages to avoid any spills. Put tape around glass jars like spice jars to prevent breakage. 10. If you're moving a washer and dryer, take advantage of the extra packing space! Place comforters, pillows, towels, or extra bed linens in your washer and dryer. Place kitchen towels or linens at the bottom of the packing box to serve as bumpers. You can also use rolled-up paper tissue around the bottom of the box to protect breakable items. Use towels or paper also at the top of the box. Use tissue paper or newspaper to wrap pieces of china and glassware. Stack up to four plates or bowls together and place them vertically in the box. Out of tissue paper? You can also place your drinking glasses in a clean sock or two. Place a biodegradable Styrofoam plate or coffee filter in between your plates if you don't want to individually wrap them. Small items such as coffee makers, food processors and other small appliances should be emptied. Wrap their cords in a plastic bag and place them inside the appliance. If you kept the original boxes, use them to pack small appliances. If not, use bubble wrap or towels before packing them in boxes. Label appliance boxes with a "Fragile" stamp so they don't get thrown around during the move. 13. Roll rugs and secure them with plastic ties. 14. Secure all doors and drawers in cabinets to ensure they don't open during the move. Use painters tape to avoid any damage on the furniture. 15. A bath towel or small blanket makes an excellent outer wrapping and padding for glass. 16. Fold draperies and curtains lengthwise, place them over a padded hanger, and then hang in a wardrobe. Curtains can be transported in suitcases—make sure you lined them with clean paper of plastic wrap. Remove light bulb and lamp harp from lamp bases. Wrap the base, harp, and bulb separately. Preferably wrap lamp shades in tissue paper, a pillowcase, or a lightweight towel. Carry irreplaceable items such as family photographs, videos, and negatives with you to your destination. Hot, humid climate could damage photograph paper. If packing mirrors or large framed pictures, place an 'X' made of masking tape over the glass in order to minimize spilled glass in the case of a break. For moving electronics, if you have the original packaging, including box, use that to pack the equipment. If you don't, purchase electronic specialty boxes from a moving company or directly from the manufacturer. Use antistatic packing bubbles or biodegradable packing popcorn. Never use materials that will conduct electricity. This could damage your electronics during handling. Once the wires or cables are disconnected, use twist ties to carefully secure the cables so they don't unravel. Place the cables and wires into a sealable bag and tape it to the piece of equipment. Worried about reconnecting all your electronics at your new place? Simply take a picture of the back of your television so you can easily remember what wire goes where. Pack less-used rooms first, like the guest room. You could also use this room for storage as you pack the rest of your home. Hanging clothes from closets can be left on hangers and placed in wardrobe cartons. Or carefully stuff all your clothes into a garbage bag—this way all your clothes are together and ready to hang in your new closet! Keep valuable jewelry in a secure box. Don't pack valuables on the moving truck. Thread your favorite thin necklaces through drinking straws or toilet paper rolls to keep them from getting tangled and use buttons to keep your earring together. Use suitcases for storing unused items. Use the dresser to transport lightweight items such as socks and t-shirts. Pack shoes in their original boxes, and then use medium-sized packages to store all the boxes. Label each box that contains footwear. This will help you save time when you are unpacking. If you are moving to a warm, humid climate, or your household is going to be stored for a long period of time, stuff a pair of socks inside the shoes to help retain the shape and absorb any traces of leftover moisture. Pack linens, sheets, and pillows in a clear plastic garbage bag. This will help you identify which bedroom the bag belongs to. Make sure the bag is sealed and labeled. Protect mattresses with old sheets or mattress covers. Draperies and curtains may be folded and packed in boxes lined with clean paper or plastic wrap. 23. Try to pack your bathroom last, just in case! 24. If you're packing toiletries that can spill, unscrew the cap, place a bit of plastic wrap on the top, and then screw the cap back on as a way to avoid spills. For any toiletries with a pump, like lotion, wrap a sandwich bag over the pump and secure with tape or a rubber band around the neck of the bottle. Before you start packing, keep the following handy: tissue paper or newspaper, packing tape and tape dispenser, masking tape, a utility knife, scissors, permanent markers, quality boxes, bubble wrap, labels, blankets and plastic bags (different sizes). Start with items you won't need right away. Label boxes clearly. Identify the contents of the box ("Books") and its ultimate destination ("Family Room"). You could also color code each room, marking all boxes destined for a specific room. Reserve a box for those items that you will need when you get to your new home: flashlight, tools you'll need for assembly, overnight bag, etc. Not everything that you need in your new home can be easily packed; this includes your internet, television, phone, and electricity services. One call to your personal move assistant will take care of all of your relocation needs. Visit movingdoneeasy.com and let your personal move assistant lend you a hand during your move. Depending on where you're moving, your new home may have a SMART METER instead of an old-school analog electricity meter. Did you know that with a Smart Meter you can monitor your usage in real time to learn when you're using the most electricity? You may also be eligible for special electricity plans and services! 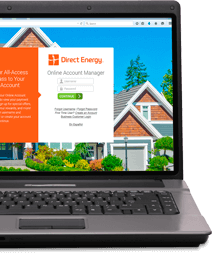 Learn more at www.directenergy.com/texas/electricity-plans. Before you move, find out if your new home has installed a Smart Meter. This type of technology can provide you more frequent, detailed information regarding your energy usage and help you lower your electric bills. Before you start moving into your new home, now might be the best time for a HOME ENERGY AUDIT. Did you know that the average homeowner can save anywhere from 5%–30% on their home energy bill when they make the suggested upgrades after an energy audit? When you buy a new home, you might be offered a home protection plan which protects homeowners against unexpected breakdowns. 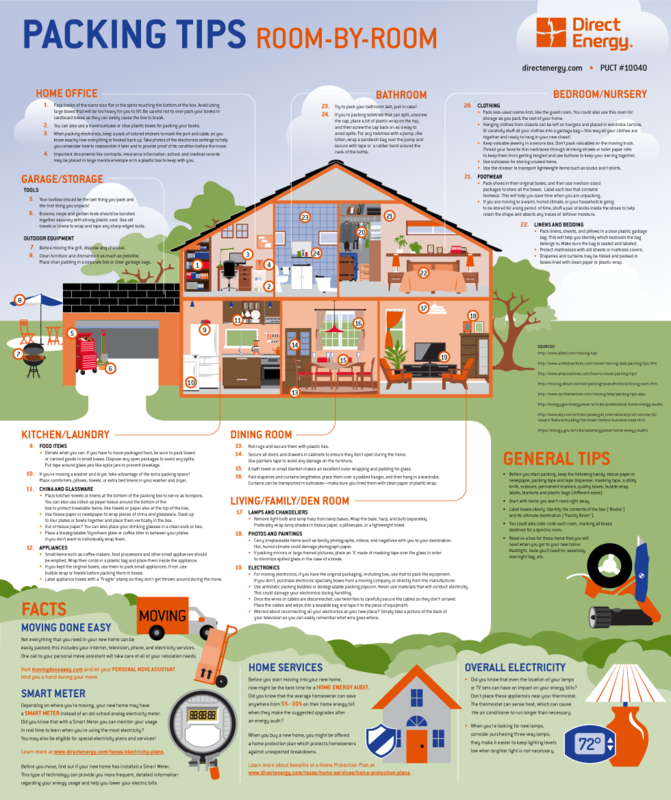 Learn more about benefits of a Home Protection Plan at www.directenergy.com/texas/home-services/home-protection-plans. Did you know that even the location of your lamps or TV sets can have an impact on your energy bills? Don't place these appliances near your thermostat. The thermostat can sense heat, which can cause the air conditioner to run longer than necessary.